Our monoblock Filling, Capping, Labelling machines are very popular amongst customers where space is an issue. This machine has a footprint of less than 4 square metres and is capable of reaching speeds of 50 bottles / minute. 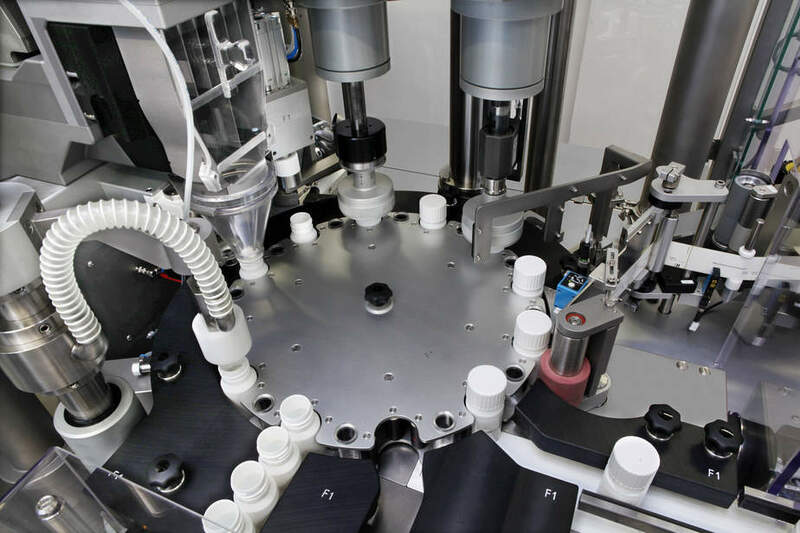 The monobloc F-AVM liquid filler is designed for projects where quick changeover is needed for large batches (>20,000 units) of products. Our F-AVM 738 integrated capper/labeller rotary machine enabled us to cap and label on the same machine frame, reducing overall footprint and cost compared to conventional liquid filling lines. This is ideal for low speed applications for which we now have many integrated capping and labelling machines in the field. Bottle air cleaning, unscrambling and other standard tablet counting line functions are also available inside the turret. Incoming bottles are filled, capped and labelled with a self adhesive wrapround label. Weight of bottles can be measured on the starwheel to confirm that the correct amount of liquid was filled in. On most of our applications we use the proven piston pump system, either a sealless rotary piston with thin products, but also rotary valve piston pumps for thicker liquids. Optional Wipotec weigh cells mounted under star-wheel to verify gross and or Tare Weight.